@algorhythmz @shakatron Actually, our workers have done an extraordinary job of keeping the system working as long as it has. @algorhythmz Exactly. It's like roof repair. Can patch here and there but eventually it must be replaced. BART is considering a $3.5Bn bond. 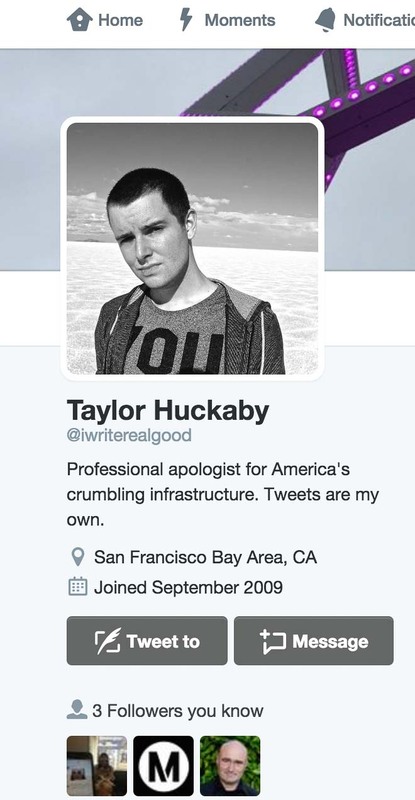 Taylor earned praise for his deft handling of BART’s Twitter feed. media attention, perhaps because they felt like a message that wasn’t run up the flagpole and edited/watered down to death. Politeness and deference are always the first impulse of transit staffs dealing with the public, but sometimes politeness turns into a habit of apologizing for everything and anything, and at that point, staff is consenting to abuse. Few public servants take as much public abuse as transit agency staffs do, almost always because of problems that are out of their control. As Jarrett also writes, there are sometimes issues beyond the control of a local transit agency — namely the lack of state and federal funding to keep buses and trains running in tip-top shape or to fund the very best alternatives when it comes to transit projects. That’s certainly true. There’s almost never the funding anymore in America to build (or rebuild) the ideal version of transit. That said, it’s also certainly true that every transit agency wrestles with issues within its control. I don’t think complaints about those type of things constitute “abuse” as long as the tweets are somewhat civil. My question for those who read this blog often or follow Metro on Facebook and Twitter: are we honest enough for your liking? Is there something we can do better? Comment please. Related: we did a podcast last year about how we handle service alerts on Twitter and why we use particular language. There are 88 cities in Los Angeles County. Most of them pay a sales tax rate of nine cents on the dollar but a few cities pay either 9.5 cents on the dollar (Avalon, El Monte, Santa Monica, San Fernando, South El Monte) or 10 cents on the dollar (La Mirada, Pico Rivera, South Gate) due to previous sales tax increases in those cities. Full list here — scroll down to Los Angeles County. As Meghan McCarthy notes, the half-cent sales tax increase that Metro is proposing for its potential ballot measure would result in a sales tax rate of either 10 or 10.5 percent in the cities mentioned above — some of which also have low average incomes compared to other parts of the county. A couple of experts note that while sales taxes are regressive — they consume a higher percentage of a lower income person’s money — they are often the most practical way of raising funds for transportation projects and programs. The map shows three possible routes to get the train to Washington Boulevard in the Whittier alternative. 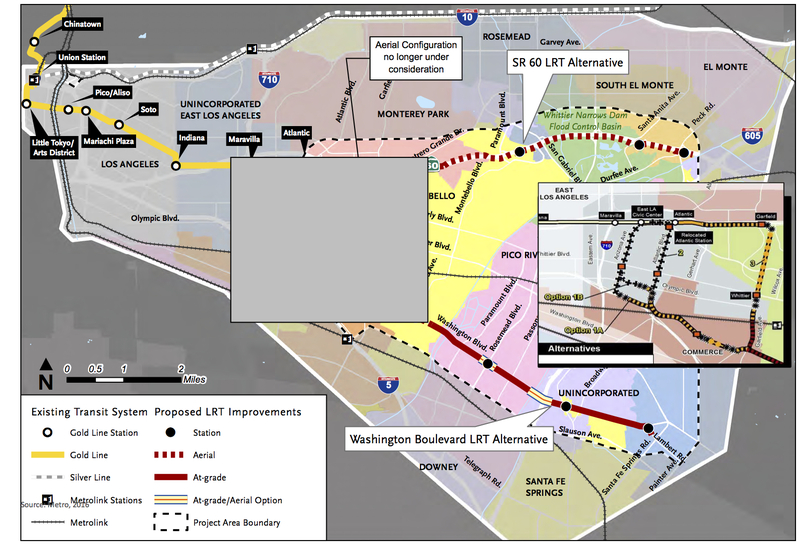 A good look at the obstacles facing each of the proposed alignments for an extension of the Gold Line from East Los Angeles to either South El Monte (a superfund site, to name one) or to Whittier (finding a feasible route south to Washington Boulevard). Under a 40-year sales tax increase, one of the alignments would be completed in the mid-2030s. If the ballot measure included a new 50-year sales tax increase, the other alignment could be constructed in the 2050s. Metro has been holding community meetings this week on the ongoing technical study for the project to identify the best routes. Two meetings remain — more info here. March 29: more reax to the ballot measure spending plan and why cars and cities can be a bad marriage. I think extending the Gold Line to Washington Boulevard makes more sense than the 60 Freeway extension. Tunnel down Atlantic down to the Citadel Outlets and then over to Washington. This would serve the East LA shopping district on Whittier Boulevard! The 60 route would be purely park and ride, not much near the stops except a big car-oriented mall in Montebello. Washington Boulevard would run closer to where more people live, work, shop and go to the hospital. To call this exchange “abuse” is laughable to those of us who have dealt with angry customers face to face. In this case, the Internet provides a great buffer that prevents this from being abuse. The BART representative is doing the job for which he is being paid, and he is to be congratulated both for giving a forthright answer and in a professional manner. Metro should take a lesson from this exchange. When agencies refuse to be transparent about operational issues, they invite nothing except the sort of anger that the BART rider exhibited. One example: Metro opened the new Gold Line extension without enough cars to run full schedules. Yet when people on this site ask for detailed information on the car-delivery schedule and how that will affect not only the Gold Line but also the upcoming Expo Line extension, Metro refuses to provide that information. That lack of transparency is among the major issues that riders have with agencies like Metro. Through March 22, 23 new light rail vehicles have been delivered. Thirteen went to the Gold Line — some are in service, some still in the acceptance/breaking in stage. Ten cars have been delivered to the Green/Blue/Expo Line divisions. None of those are in service yet but are expected to be used on the Blue and Expo Lines. Deliveries continue with Metro hoping to receive one new rail vehicle each week. Steve: That news is very helpful, and encouraging for the opening of Expo Phase 2. By my estimate, the Expo Line will require either nine or ten trains to operate between LA and Santa Monica. Assuming each of the ten cars delivered to the Green/Blue/Expo Line divisions have completed their acceptance/breaking in stage within the next two months, they should be available for revenue operations by May 20, allowing a return to three-car service on Expo. In the meantime, I hope that those cars can be introduced into service ASAP, since the two-car service on Expo has resulted in by far the most crowded service on the Metro light rail system, with average peak loads far above the seating capacity. By my calculations (I can show you my math if you’re interested) the peak period peak load point for Expo serves approximately 105 passengers per rail car, as compared to peak loads on the other three LRT lines of 76 (Blue Line), 53 (Green Line) and 67 (Gold Line) peak passengers. For reference, most Metro rail cars seat fewer than 70 passengers. The calculation for the Gold Line loads is based on ridership before the opening of the Foothill Extension, so the current ridership loads are certainly higher, but not nearly as crowded as on Expo. Sure thing, Eric. I want to stress: I don’t know when the new cars will go into service. We know the trains are crowded. I can’t predict the future deliveries. I think it’s safe to assume that Expo 2 will be very popular and that peak hour trains will be crowded. Yes, the new rail cars are on order and will eventually be placed into service. I don’t want my replies to be taken as promises as there are variables well outside of my control. Thanks for the details. I’m not as sanguine as “ExpoRider” about how this will help break the Expo logjams because I think ridership will go up significantly due to beach traffic. We’ll see. How many total cars have been ordered under this contract? Are there provisions to increase the number of cars if Expo 2 proves to be significantly more popular than expected or is the budget tapped out? The base order was for 78 new light rail cars — those are the ones to be delivered by fiscal year 2016-17 (which ends June 2016). Metro has also exercised four options to bring the total order to 235 light rail vehicles. The vehicles are planned to be used throughout the light rail system both as new cars and replacement cars. Again, I don’t know how many cars will be available when Expo 2 opens. Unless I’m mistaken, I think ridership will be very healthy and I think we can safely expect for trains with a lot of people on them. It’s not an ideal situation but it’s also not a permanent one — the new cars are on order and will be delivered in time. Steve: Since you asked for it… I generally find responses from The Source to be accurate and honest, though it does seem that you avoid answering some of the more sensitive questions. For example, for the past month I’ve been trying to get information about the delivery delays of the new rail cars needed for the Gold and Expo Line extensions, but I’ve yet to receive any acknowledgement that the delivery is behind schedule, much less a warning about how these delays will impact the operations of the two extensions for the next few months. I think Metro would be better off if they were more honest up front and explain to the public that the services will be very crowded for the next few months, but they should improve when the new cars are delivered within the next x months. Thanks Eric. Sometimes I have the info readers want, sometimes I don’t. I know that some people want exact numbers with the rail cars (these requests are few compared to our larger readership), but I also think we’ve said in the past that we’re opening the new extensions without the full initial order of new light rail vehicles and that means some compromises in terms of service. Also, the number of rail cars being delivered and in service is often in flux — what’s true this week may not be right next week. I do think we could probably push that message harder and we likely will before Expo 2 opens. Another thing worth mentioning: there are different perceptions of crowding among riders. Some riders find our trains very crowded; I’ve only occasionally found them rivaling the type of crowds I frequently experienced when I lived in Chicago and New York, respectively, and rode the CTA and NYC subway. So there’s that. I would agree with that, Steve. I have long been an avid user of public transit with experience in all three cities, and never have I experienced crowded trains in L.A. such as are common daily when riding in Chicago or New York. To me, it is understandable that Metro would be unable to precisely state when new train cars would go into service, since there are so many variables not under their control and information that is dependent on others such as manufacturers who themselves might not be forthcoming. I would also think it common sense to expect somewhat less than regular service whenever a new line opens and ridership increases. Rome wasn’t built in a day. It’s better to have some trains running rather than to wait until all are delivered or everything is ‘perfect’. Overall, I think Metro does quite well, especially when compared to many other cities. 1. I’ve ridden the subway frequently in NYC and I (and my son, who rides the Gold Line much more than I) have found the Gold Line to be almost as crowded during rush hour anything I encountered in NYC. One can only hope this will smooth out in the coming weeks. 2. I don’t agree that it’s “common sense” to expect somewhat less than regular service whenever a new line opens. The “less than regular service” is almost entirely related to the issue of late car deliveries, something that has worried many regular riders for a long time — all that we predicted has come to pass. Moreover, when Expo 2 opens on May 20 things will likely get much worse since, by Steve’s response above, only about 6 more vehicles will have been delivered by then, not enough to handle the longer rides and (one presumes) increased ridership. I’d say that more concerning that the small stuff like service alerts is Metro’s large-scale communications duplicity. Most people in the Metro building knows that the Measure R2 sales tax won’t do anything for congestion (and the sharp ones know even when the system is built out that ridership won’t substantially increase). Yet the agency is building it’s sales tax campaign around this big lie. Just because polls show congestion relief is what voters want doesn’t mean you should mislead them in being able to provide it. Now that the Mayor and the Metro CEO are getting behind this fact-free speculation, none of the people who value their future employment will speak up. It’s ironic that a post like this can can reference the Robert Ebeling story “about finding the courage to speak up in the workplace.” You expect this acquiescence from the political offices, but public agencies should do better. The civil service designation at places like Metro is supposed to protect us from precisely this phenomenon. Yes, I think Metro does a decent job with the small stuff, although I am noticing a longer and longer time to receiving acknowledgments of service failures (it recently took several weeks to acknowledge that a bus failed to stop at a posted stop on a detour, when in the past that acknowledgment of receipt would have been made within a day or two). Public agencies need to be very careful blocking people from Twitter and Facebook, a comment I made on my comments to the Public Participation Plan. When Metro Expresslanes staff block critics of the project like Erik Griswold, that is not cool. Also, I’m hearing ads on the radio about the “easing traffic” stuff again, when the fact is that traffic congestion in Los Angeles County continues to grow and has not stopped growing. Metro provides great alternatives, but travel times in general purpose lanes virtually never drop after a transit project is implemented. The messaging for the Potential Ballot Measure talks a lot about Measure R but never mentions Proposition A and C. What is it paying for? Are we still paying bonds to build the Blue Line and the Green Line? When will those bonds be paid off? Which is funny because I am not against the Express Lanes per se, but the degradation of a once-bus-only facility into an SOV facility. And since it has price caps, it has also become like a Summer Line-up for Winter Boots in the old USSR. For what it may be worth, I’ve tried to be very careful over the years on the blog to present transit as an alternative to traffic (along with other benefits–i.e. potential greenhouse gas reduction, potential to spur good development, etc.). I also try to post links to the latest media articles about Los Angeles traffic whether the studies have good news (rarely) or bad (often). I know there are others who also take issue with the marketing campaign. For what it also may be worth, I do let people here know when riders and readers have concerns. I know that may not be enough for some. It’s also worth noting that there are lot of opinions at Metro and beyond than just my own (on a variety of issues). I personally do believe that there are many transportation improvements in the potential ballot measure that would greatly benefit the region. For what that may be worth. All that said, I hear your concerns loud and clear and I think comments such as yours are very healthy for public discussion of public policy. If I can get from point A to B without having to sit in traffic, that sounds like congestion relief to me. Yes – the Source is a big part of the reason why I am mostly satisfied with Metro. For most inconveniences, all that is needed is an explanation why or even an acknowledgement of the problem and the Source serves that interactive purpose well. You think L.A. Metro isn’t up to par? Try living in another city where they still don’t have TAP cards or shut down the system regularly for parades. Congestion. The word, as B. Kuo demonstrates in his comment, needs to be redefined. It can’t just be about cars stuck in traffic on the 405 or the 10. It has to be about mobility. There’s a hint of that in the new radio commercials I’m hearing on the radio. But it’s just a hint. The fear, I suppose, is that by making it more overt, drivers will catch on. And vote no! To be honest, it’s been difficult to even get acknowledgement of a complaint made through the correct channels (i.e. the website). Remember, I was told by your Metro Security Services (the ones with the fancy swords at the Gold Line Extension opening) that they are not authorized to go to the platforms to assist a passed out (sleeping? dead?) passenger (because they had to enforce fares on the mezzanine?). At least Twitter allows us the chance to commiserate and realize we are not alone in out angst. Just wait until you join the 1990’s and get an SMS number we can text complaints too!